Get ready for some pumpkin pie foolery. Pumpkin pie is back on the Thanksgiving table for all of you who avoid eggs and dairy thanks to this no bake pumpkin pie filling. A couple of weeks ago I looked out back to find pumpkins strewn across the yard. My boys had “planted” a pumpkin patch with the dozen pie pumpkins I had bought. It looked like a pumpkin Easter out there! I had developed a determination—bordering on obsession—to deliver a no-bake egg-free and dairy-free pumpkin pie filling. In my notebook I had recorded eight attempts before landing on this one—my most tested recipe to date. This pie filling blows me away! First off, it’s no-bake. Second, it’s a near dead-ringer for the back-of-the-Libby’s-can pumpkin pie. Dairy and egg allergy peeps, get ready for some pumpkin pie foolery. It’s time to celebrate. Pumpkin pie is back on the Thanksgiving table thanks to this no bake pumpkin pie filling. Enjoy! UPDATE! I have since developed an even SIMPLER version of this recipe that you might want to check out. In large pot combine and gently simmer water and agar agar 2-3 minutes. In a high-powered blender (such as a Blendtec), blend remaining ingredients on high for 1-2 minutes or until super smooth. Whisk pumpkin mixture into simmering agar agar mixture. Return to boil and simmer for 1-2 minutes or until thickened. Pour into a pre-baked, gluten-free pie crust. Here's the one I use. Refrigerate 2-4 hours or until chilled through. Serve chilled or bring to room temperature (see notes). Agar agar is a gelatin derived from seaweed. One of the qualities of agar agar is that it begins to gel at 95?F or 35?C. Unlike good old Knox® gelatin (animal derived) it will not turn back to liquid at room temperature, but rather will hold its shape and remain solid. For this reason, this pie can be served at room temperature without any worries of it losing its shape and texture. Have you been looking in my kitchen? I just baked two small pumpkins yesterday and soaked some cashews and almonds. All I have to do to put this together today is take my agar agar flakes and pulverize them (I can't find them ground). I am so on this recipe. Thank you, thank you, thank you. You are so creative Lexie! I have to admit, agar intimidates me. This simmer method sounds much easier than most I read though. This pie looks wonderful — and healthy. Plus, I have agar agar, maple syrup, all the rest of the stuff AND a couple of Grant Farm pumpkins. I need to add that GFF link onto my blog (sadly, I have no clue how to do any of that techy stuff). Good one, Lexie. I will try this. Applesauce is a great idea to throw into the mix. I'm definitely trying the coconut whipped cream I've been seeing around the blogosphere. I love coconut and can only imagine how tasty the whipped cream version is. Peace, love and pumpkin pie! I love pumpkin pie, but have been avoiding it this year because it seems so heavy. Your non-dairy version sounds like a much lighter way to go. I tried a cashew-based raw cheesecake when we were in San Francisco and couldn't believe how much it tasted like the real deal. I guess I'm finally a believer. Great minds think alike! From pumpkin filling to the ISI whipper…isn't that just the best? I like your idea of adding applesauce to the mix. This pie looks amazing. I love that it doesn't have to be cooked, I love that it doesn't have any baking soda, I love that it is gluten free and dairy free ,and I love that it is so healthy. Thanks for explaining about the ingredients like agar too. I will definitely make this pie this Thanksgiving. Great post! 1 T. animal gelatin= 2 T. agar flakes=1 tsp. agar powder =2/3 of a bar of kanten = 1 tsp. powdered carageenan or irish Moss= 0.3 oz. (10 g) packg. vegetarian kosher jel (such as Carmel or Kojel—NOT Emes), about 4 1/2 tsp..
She says you use 6, yes 6 times as much agar agar flakes as you do powder. That's definitely going to use up the entire bag I have for sure and I'm going to grind it in my coffee grinder because I don't own a mortar and pestle. I love the idea of a no bake pumpkin pie! I've only had one really bad experience with agar agar (I tried to get all fancy and make Johnny Iuzzuni's basil gel to plate a dessert and it just didn't work out). But the idea of using agar agar to set the pumpkin custard is brilliant! Now I should see about planting some pumpkin vines in my backyard. How great is it that you have pumpkins growing! I love that! Hi again. I think I need some advice as I'm this close to pumpkin pie achievement. So today I took both my pretty little pumpkins that I'd cooked in the crock pot (brilliant idea, thank you), cut them in quarters and scooped the seeds into a strainer and the pulp into the Vitamix. I made my beautiful puree, rinsed the seeds to bake and made pumpkin milk instead, after all they'd already been plumped right? BTW I had a smoothie with some of the milk, cashew yogurt, banana, strawberry, stevia and a slice of ginger, mmm mmm good. Then I took my flaky agar agar and put it in the coffee grinder until I smelled smoke which was just a couple of minutes. It kinda looks like coffee crystals. Was it supposed to make a true powder or is that the right consistency? If it's supposed to be a finer grind I'll probably use a little more than called for in the recipe but nowhere near six times as much as the volume did decrease dramatically. So pumpkin pie guru lady, what do you think? I am all set to make the pie, but I am having difficulty finding agar powder in my area. Can I order it online? Hi there. Well, I finally did it in my bass ackward way. I always think I've got everything in there until the very end. "Oh yeah, it's not as thick as I thought, oops Tapioca Starch!" ADD is such a blessing (yeah, so I'm a liar, and? I have to deal with me somehow). So here's my report. I didn't want to throw out another pie shell so I made trifle! I had some raw cashew cheese cake set aside in a tupperware and layered that with your lovely pumpkin pie. I ended up taking a rolling pin to my agar crystals and used 2 heaping tsp thereof. My desserts are so pretty. The only thing they're lacking is the whipped cream that would have adorned them if I'd won that "iSi" and maybe chocolate shavings/chips. Oh and because I'm so bad at paying attention there's also an extra 1/4 tsp allspice and ginger because I got confused and failed to double check the recipe before dumping in my spices so I got all yours plus some extra. It's really quite spicy but plays off the "cheese cake" quite well. So Lexie, thanks again for the recipe. Next time I'll paste it onto some body part or other and do it right; although you know it's gotta be a master recipe if I can mess up so many times and still have some of the best pumpkin pie I've ever eaten. Hip hip hooray!!! I am doing a happy dance. I get so nervous when people try my recipes for the first time. I think they're good, but will everyone else? Thanks so much for taking the time to report back :). Your cheesecake and this pumpkin filling are on my to try list! Sounds divine. I can see you beating that agar to bits. HA! And I am glad you added ginger. I think I OD'd on ginger a while back and so it just did not appeal to me when creating this recipe. But my tester mom asked "where's the ginger?" Big hug and thanks for sharing your experience with us. I am very excited about trying this pumpkin pie recipe. Unfortunately, since we are on such a restricted diet, there are some ingredients that I would need to substitute. Can I have your advice on whether you think these changes will work? We can't have cloves–is it necessary or should I substitute something else? We can't have tapioca/flour. The only flour we can have is made from cashews or pecans. What is the purpose for the flour and Is there something else I can use? Thank you so much for going through the trial and error of trying to figure out this recipe. I was planning to do the same thing and am hoping that your hardwork will alleviate my efforts. Thanks again, and Happy Thanksgiving! We can't have tapioca/flour. The only flour we can have is made from cashews or pecans. What is the purpose for the flour and Is there something else I can use? THE TAPIOCA FLOUR ADDS A BIT OF A PUDDING LIKE THICKNESS. I WOULD EITHER OMIT OR USE ARROWROOT POWDER (BUT THAT MAY BE OFF YOUR LIST, TOO?) THE THING WITH ARROWROOT IS YOU'LL WANT TO ADD IT IN AT THE LAST MINUTE AND NOT WITH THE BLENDED INGREDIENTS (maybe you are familiar with it?). SO MAKE A SLURRY OF IT WITH A COUPLE TABLESPOONS OF WATER. THEN ONCE THE PUMPKIN MIXTURE HAS COME TO A BOIL, WHISK IN THE SLURRY AND SIMMER FOR ONLY 10 SECONDS AND REMOVE FROM HEAT. OK, I have no problem with eggs or dairy, but this sounds so much easier than a traditional pumpkin pie. I don't like making them because I always spill all over as I'm taking it to the oven. And you have to cook it just right. But, if this tastes just like regular pumpkin pie, then why not? Plus, I just like the idea of using as little dairy as possible. But, like Heidi, I love cheese. That's hard to give up. Eh. Foolery, indeed! Just looking at the picture is making my mouth water — and I don't even like pumpkin pie! Voila! I just tried a test-run of what I'll serve next week at Tgiving dinner. It's in the fridge now cooling. My poor little guy has suffered from allergies since birth, and I have never been brave enough to try an egg-free, dairy free pumpkin pie (until now!). I followed the directions (without nuts), so I improvised a bit. Thank you so much for the Agar Agar tip!! Like others, I used the flakes when I couldn't find the powder. I see what you mean by the "weirdness". I'll simmer longer next time…but this stuff is GREAT, and very mild taste too. You've helped me reach out of my comfort zone today. Thanks for the great recipe! I can't get over how many pumpkin pie recipes I am finding, I am going to have pumpkin pies soon everywhere. I am baking pies for our church dinner program, so I do need lots of pies, and everyone is going to be different. Thanks for your no bake pie. I'm sitting here trying not to fret over my first gf Thanksgiving. Can I use gelatin in place of the agar? Mmm, I made this and it was great! Everyone loved it! I left out the agar because we didn't have any and just dissolved two tablespoons of gelatin into the water. Judee, Thank you for sharing your success. I have to agree that it's a pretty tasty pie! And easy, too. I appreciate your taking the time to share your culinary success. Hi there! I just found your site from Finding Vegan- this looks amazing! Have yet to find a great vegan pumpkin pie recipe, so I'm thrilled to try this! It may be a silly question, but can I use canned pumpkin? And how much- the same amount? I'm a little behind and it's no longer pumpkin time around here, but I want to make this! Thank you for any advice and for posting such an awesome-looking recipe!! This looks delish! I will have to give it a try. Maybe I can trick my fam in to eating something healthy and all natural 🙂 I think I even have all those ingredients in my pantry! OMG! I have been on the Seignalet diet for my fibromyalgia (similar but more restrictive than Paleo diet) for 6 weeks now and so not being able to have Casein, gluten, corn, refined sugar, and not being able to cook above a certain temp… I had given up on A LOT of things. 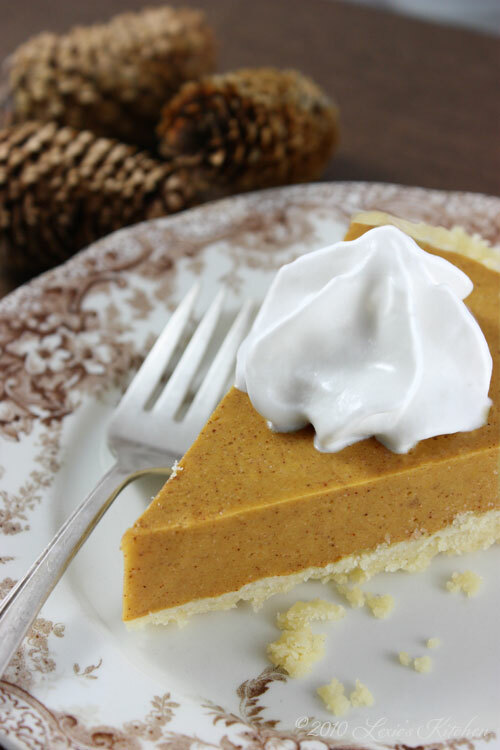 Pumpkin pie is one of my all time favorite desserts and i grew almost teary eyes when i saw this no bake GFDF and refined sugar free recipe. I LOVE YOU! There are SOO many things you can do with nuts that i had NO CLUE! Cheese? yogourt? OMG. I'm happy again. I couldn't find agar agar powder, just flakes at 2 natural food stores, follow your heart and whole foods. Can I just grind up the flakes in the vitamix or bullet to make a powder? If not I guess it will be "knox" for me. thanks for letting me know before the big day. Okay, so the reason I do not use flakes is because there is more room for error. The error being that folks do not boil them down long enough. They may appear to be dissolved, but you have to look close to be real sure. If you do not dissolve all the way, you will get hard, clear bits of agar when the pie sets. That being said, you may use the flakes you bought. The conversions I read are of 2 Tablespoons Flake = 1 Teaspoon Powder. So going by that you will use 1/4 cup flakes. And no, no need to grind them. Because you will be simmering for longer, take into consideration the liquid that evaporates off, so you may want to add an extra 1/4-1/2 cup water. I would simmer 10-15 minutes … perhaps look up the best way to prepare flake agar. Sarah, Thank you for your comment. BINGO! That is where I get mine … so much cheaper. The one I buy comes in a white packet with blue and red. I buy 4 at a time and dump them into a jar for ease of use. Have a GREAT day tomorrow!! Can you substitute macadamia nuts for the cashews? And if so, does this substitution always work? Thanks!